Sunday Links: The Marty Monologues Plus The MBIP Coming Attractions! Tonight I’m doing something I’ve always thought about doing but didn’t think I’d ever have the nerve to do. It’s either going to go very well or it could just be okay. It’s not going to be horrible because there’s going to be great music, three sandwiches and free chicken wings at Kenny’s Westside Pub after the show! And the show I’m talking about is The Marty Monologues and below are six links about tonight’s show and then there’s the brief MBIP Coming Attractions for the limited week next week! 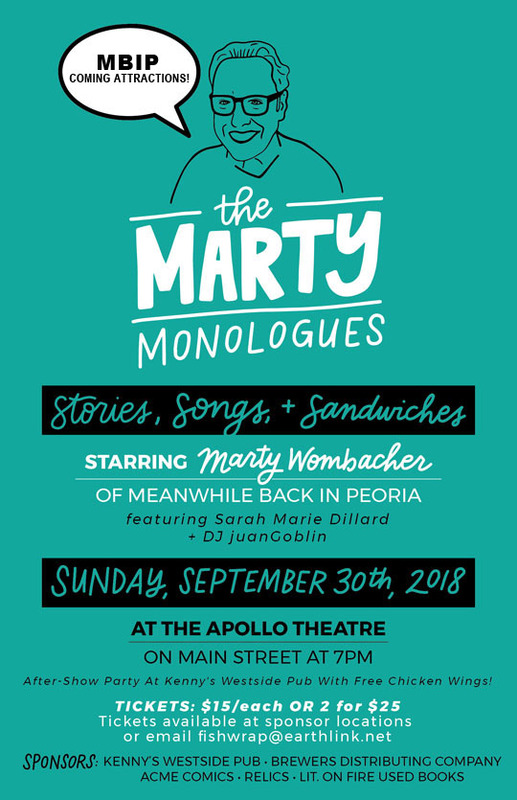 A preview of Marty's monologue - Here I am yammering about the show on Good Day Central Illinois with Mark Welp, Shelbey S. Robers and Lauren Rainson. Tarter Source - Steve Tarter has been a friend for decades and he invited me to discuss the Marty Monologues and other topics on his PJ Star podcast. Chelsie Tamms and Lettering Works - The branding, artwork and design for the show was done by Chelsie Tamms and even if the show tanks, I’ve got this wonderful artwork that Chelsie created for the show! Check out her website to see more of her work. Sarah & The Underground - Sarah Marie Dillard and Brandon Mooberry are going to be performing live at the beginning and at the close of the show. We heard the songs last Thursday and they’re worth the price of the ticket alone! DJ juanGoblin - You will be entertained before the show and during the story interludes with hand-picked tunes from DJ juanGoblin. The facecrack events page - Here’s all the information on facecrack, we’re selling tickets tonight at the show if you decide to stop by. Hope to see you there! Tomorrow I’ll be posting photos from The Marty Monologues Show and from the after-party at Kenny’s Westside Pub. Then I’m going to collapse for the rest of the week. This has really been a nerve-wracking time in my life and so I’m taking Tuesday through Friday off to regroup and get ready for the next round of MBIP updates! I’ll be back on Saturday with a new weekly weekend feature: The MBIP Saturday Morning Book Club! We’ll see you then and maybe I’ll see you tonight at the Marty Monologues. If you procrastinated, tickets will be sold at the door, it’s fifteen bucks for one and twenty-five for two! Related Posts: Sunday Links: Bill Murray Stories, Jimi Hendrix and Richard Pryor.